taking place in venues in the UK and Ireland, this is a 3 day course for professionals offering an opportunity to explore one’s own experience of attachment dynamics in the context of a confidential closed experiential group. The work will be supported by didactic input and time for reflection, application and analysis. It seeks to address the fact that as we work in jobs that require us to respond to the needs of others, too often we don’t create the conditions to support our own personal and psychological development. Experiences of careseeking and caregiving have their roots in infancy and shape our expectations and responses to careseeking and caregiving in adult life. As professionals offering a service in the field of mental health and social care we will be aware of the many different ways that people express their careseeking needs, and how difficult it is sometimes to interpret these accurately and respond. People who have had contradictory experiences of caregiving will often tend to miscue professional caregivers so that any attempt at caregiving is frustrated and can end up as a frustrating experience for both parties. The dynamics of attachment consist of several goal-corrected systems. These are careseeking, caregiving, sexuality, exploratory interest sharing with peers, the personal system for self defence, the internal supportive or unsupportive environments and the personally created external supportive environment (home/lifestyle). The theory suggests that these systems work together as a single process to contribute to and maintain maximum wellbeing. 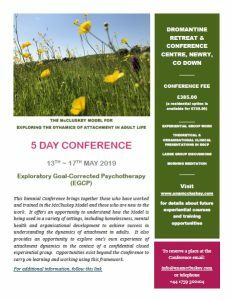 Each session will have a short didactic input on the attachment system to be explored that day, followed by two experiential groups with a short break in between. There will be time to identify what people are learning, discovering or applying to their own practice. Una McCluskey has been researching attachment dynamics for many years and will seek permission from the group to continue this work. Places are limited. Click on the link ‘Courses in the UK’ or ‘Courses in Ireland’ to download a flyer and application form. This entry was posted in Exploring the Dynamics of Attachment in Adult Life. Bookmark the permalink.